I discovered Emotional Freedom Technique (EFT) also known as Tapping, when I was leaving my consulting career and stepping into being a full time entrepreneur. To say that I was afraid during this transition would be an understatement. Feeling terrified would have been more accurate. I kept bumping up against money fears, money challenges. I had no idea how I would ever make the same amount as a coach and healer as I did in a reliable every month income that I did as a consultant. I had no idea where and how I would find my clients (up until that time they were only word of mouth and I only had one to five clients at a time because I was also consulting full time). Stepping into full time entrepreneurship in the healing arts, was one of the most fear-filled, challenging times of my life, even more so when I was healing my other core wound that I would never be able to manifest a life partner. I quickly realized all of the tools that I used to up-level into love and marriage were not working for this much deeper rooted limiting belief about money, doing work I loved, feeling worthy and deserving of that, trust that the Universe would provide, that it was safe to receive, and I could still provide a quality life for my family. I had to access something new. I prayed for support and that same week I discovered the book Tapping Into Wealth by Margaret Lynch. In the tapping you will state what you are afraid of, or the old belief that you are buying into first, then you will state the new truth. Most clients fear that they are affirming the old belief by stating it, but the opposite is actually happening. By stating the old belief you are acknowledging it and honoring it. By going to that layer of hurt, pain, or fear, you can genuinely start healing and rising into a new belief. Think of it this way. When we get a bad cut on our skin, we have to first clean out the dirt and bacteria from the cut before we start the healing process. If we do not, new layers of skin will form but the bacteria will still be in the core. Your beliefs, core wounds, are similar. As children we did not have the consciousness and reasoning that we often do as adults. So we make up stories about our situation and our worth and then start forming layers upon layers through life that have that story at the core. We need to dig down to the unconscious core, move through a process of “cleaning out” and “clearing out”. If you need scientific proof, check out this trial that investigated the power of EFT in subjects with PTSD by the National Institute of Health. Overall, “…practitioners (63%) reported that even complex PTSD can be remediated in 10 or fewer EFT sessions.” Why does tapping work? When we are only using the mental and emotional level to process fear, we are not getting to the physiological fear that is stored in the body. Tapping allows us to get to the fear at a cellular level through acupressure points that light up the parts of the brain that can shift and create new neural pathways. Tapping will include the following points as noted above: karate chop on the side of the hand, top of the head, inside of the eyebrow, under the eye, between the nose and lip, chin, collarbone divot, under the armpit. Here was another big one for me. Interestingly through reading this book I realized that I had unconsciously taken on the story that my dad had about doing work you love and making money doing it. As a young man fresh out of college, my dad became a science teacher. But when my mom became pregnant with my brother my dad felt he couldn’t make enough money to provide for his family, so he left the profession, and got a “real job”. When he was 55, the “real job” company was sold and he found himself unemployed at 55. He soon found himself working in another positions that did not make his heart sing. Around this time I discovered The Law of Attraction and shared it with him. He quickly called in an ideal job, making ideal money, teaching! At the end of his career, he was doing work he loved, making more money than he ever had, through corporate teaching. Then you will go through each of the points, stating the same statement above while tapping. As you move through the points, you might notice that the statement changes and flows into other beliefs and more truths. 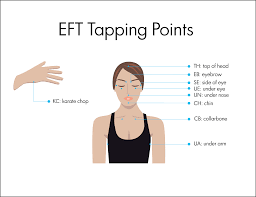 The other reason EFT is easily measurable is because you can rate how you feel prior to starting the tapping. Rate yourself on a scale of 1-10, 10 being the most fearful or triggered, 1 being the most neutral. Say your statement out loud, then rate yourself as to how triggered it makes you feel. Then go through all of the tapping points. Then rate yourself again. Have you gone down? Keep tapping until you get to 1 or 0. Repeat whenever you notice this limiting beliefs or old stories come into your consciousness. If you are curious to learn more about your relationship with money, and elevate into a new relationship, here are a few of my other favorite spiritual and conscious money books, scroll down to the money section. I’d love to hear more about how this experience is for you and if you have any questions!